Hello and welcome to my website, dedicated to Graves’ disease and Hyperthyroidism patients, to alternative and natural solutions for treating Graves’ disease and hyperthyroidism! 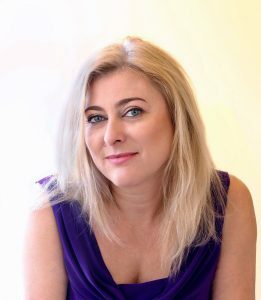 My name is Svetla Bankova, and I am a former Graves’ disease and Hyperthyroidism patient. I’ve also written 6 books on Graves’ disease and hyperthyroidism and conducted extensive research on the subject for the past decade. I am Graves’ disease free for 11 years now. If you would like to learn my personal story and how I managed to cure myself, and what alternative therapies I’ve used in my own healing journey, subscribe to the free ebook on the right and you’ll be taken to a page where it says it all! Have in mind that results may vary from person to person. Discuss what are the causes of Graves’ disease and what triggers it. Outline a holistic approach to treating the cause of Graves’ disease and hyperthyroidism. I have to start with the fact that Graves’ disease is a very serious illness and Thyroid storm (caused by a sudden release of large quantities of thyroid hormone) can be fatal. Fortunately, many cases are much milder and can be treated with some natural approaches. Often your doctor or endocrinologist may recommend your thyroid gland to be destroyed or removed, either by RAI (Radioactive Iodine Treatment) or thyroid surgery (a procedure where the thyroid gland is completely removed). May be there are some cases that a surgery is unavoidable (thyroid cancer for example), however, in most of the cases these permanent interventions are not necessary at all! Graves’ eye disease (Thyroid eye disease). Protrusion of one or both eyes. Hair loss. Dry and itchy skin. Heat intolerance. The above list, of course, is not complete. Many people will experience some of the above symptoms, and others that are not mentioned here. However, most of the patients are not in a somewhat emergency situation where their thyroid gland has to be taken out or destroyed right away. Diagnosis may come after a long period of looking for answers and experiencing symptoms that are just not put together to define “Graves’ disease”. This was my case: I chased doctors for more than 6 months and experienced most of the symptoms listed above, just nobody was able to do the math 1+1=2 and come up with a valid diagnosis. At the same time I’ve met people in the past 11 years who have been in this position for years. After being diagnosed, patients are often made to feel fearful and intimidated. They are told there is no known cause for Graves’ disease and that Graves’ disease is for life, which is not really true, because of today we, in fact, know a lot about auto-immune disorders, just this information hasn’t made its way to the conventional medicine yet. Treatment options presented to the patients revolve around three options only, as defined by the medical doctors: RAI, thyroid surgery, or aggressive anti-thyroid medication (Methimazole or similar). None of these methods will actually cure Graves’ disease! Having in mind the so presented treatment options, it is no surprise that Graves’ disease patients find their experience with conventional medicine hopeless or depressive. Once the doctor says “There is nothing better that can be done”, the patient will feel helpless and desperate. That leads to emotional paralysis and lack of action, and I believe that patients have to feel self-empowered and able to take control over their health in order to regain their health back. Only a self-empowered, proactive patient is going to take steps, necessary to recover from an auto-immune disorder! So, one of my jobs as a former patient and a person who read, wrote and researched a lot about Graves’ disease for more than a decade is to educate people that there is a lot they can do, in fact, to get better and recover their health. First, do your research. We know today that the causes of Graves’ disease are not entirely unknown. Of course, there isn’t one single cause of Graves’ disease, which can be removed and you can be done with it, but if you follow a natural treatment protocol I strongly believe that you can get better. Graves’ disease, as well as any other autoimmune disorder, is a multi-factorial problem and the treatment plan should be individualized for every single patient! There isn’t one single treatment protocol for everyone, however, science does have an idea what factors may contribute to Graves’ disease, even though that knowledge seems to not have made its way entirely to the conventional medicine. In fact, it is easier for doctors today, and way more convenient for them, to offer expensive permanent procedures like thyroid surgery or RAI treatment, even though they do not solve the medical problem for Graves’ disease patients. Depending on the case, toxic medications like Methimazole or Propylthiouracil may not be needed and the destruction of the thyroid gland is not inevitable. Graves’ disease- Thyroid or Autoimmune disease? – Controlling the symptoms of Grave’s disease, using natural therapies as much as possible (herbs, vitamins, supplements) instead of toxic medication. – Treating the underlying immune system disorder, which will reverse Graves’ disease completely. If this not done in that particular order and the thyroid gland is removed or destroyed, permanently, your confused immune system will simply find another organ to attack. That’s why many people may have two or more auto-immune system disorders simultaneously- Rheumatoid arthritis, Diabetes Type 1, Lupus, Hashimoto’s disorder etc. Or, after the thyroid gland has been destroyed, they may develop, very likely, another auto-immune disorder. How can you control the Graves’ disease symptoms via natural methods? You should know that Graves’ disease is too dangerous to be left untreated without controlling symptoms in the meantime. If you chose the least invasive method, i.e. the medications, that’s fine. But medications are too toxic to be taken for an indefinite period of time, and herbs and supplements are not if they are used in a responsible way. Should you stop you medication? 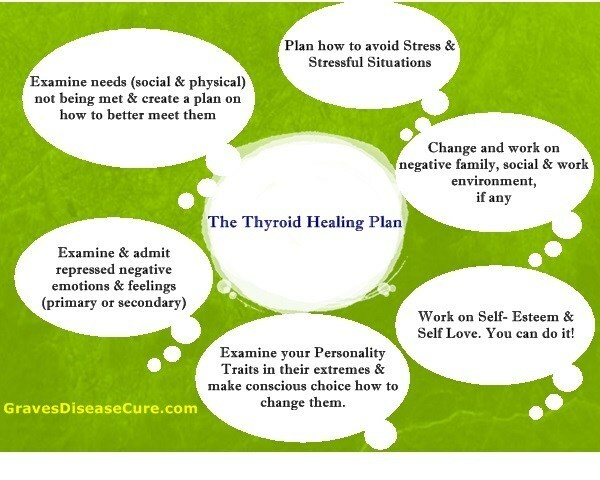 Do not stop your thyroid medication “cold turkey”, or without talking to your prescribing doctor about it! You don’t go out and get a bunch of supplements, vitamins and herbs and just stop your medication! All these holistic products are added to the medication, then as the symptoms improve, and that possibly is reflected on your thyroid test results, you go and talk to your doctor to gradually lower your medication until is completely unnecessary. That’s the right way to go! There many studies, conducted after II World War by scientists in different countries showing the benefits of L- Carnitine in patients with Graves’ disease. It is found that carnitine blunts the action of excessive T3 levels (the active thyroid hormone) of cell receptor. However, in healthy patients, it has no such effect. To date, clinical trials have shown that doses of 2,000-4,000 mg/day (2-4 g daily) of L-carnitine are helpful in individuals who suffer from hyperthyroidism symptoms. 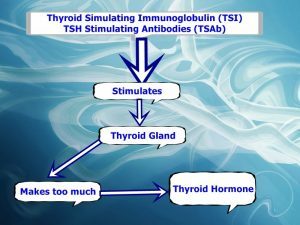 Many studies demonstrate that Selenium supplementation with 200 mcg of sodium selenite may improve the inflammatory activity seen in patients with autoimmune thyroiditis, and may result in a decrease in production of thyroxine (T4), although there may be an initial transient increase in T4 to T3 conversion. It may also reduce ocular involvement, and slow progression of the disease in patients with mild Graves’ eye disease (TED). Reference: Serum Selenium Levels in Patients with Remission and Relapse of Graves’ Disease, Department of Endocrinology, Diabetes and Rheumatology, University Hospital Duesseldorf, Duesseldorf, Germany. Med Chem. 2007 May;3(3):281-4. Author(s): Tina Wertenbruch, Holger S. Willenberg, Cornelia Sagert, Thi-Bang-Tam Nguyen, Maryam Bahlo, Joachim Feldkamp, Claus Groeger, Derik Hermsen, Werner A. Scherbaum and Matthias Schott. The list of useful supplements is neither complete or exhaustive. There are, of course, many other supplements and vitamins which are antioxidant and anti-inflammatory, like Flax seed oil (great for Thyroid eye disease as well), Vitamin D, Vitamin E and A (skin and hair), Vitamin B complex (nervous system), copper etc. that can improve the hyperthyroidism condition, depending on what you body lacks (usually found through vitamin deficiency tests). As I already said, treatment is very individual. But these additional supplements may work together to fight inflammation and balance the immune system function. I am a big fan of herbs and herbal teas and I believe that Mother Nature has it all to help our bodies fight disorders of any kind. Some of the most potent herbs for controlling the symptoms of Graves’ disease (the list is not complete) are Bugleweed (Licopus), Lemon Balm (Melissa Officinalis) and Motherwort (Leonurus). Motherwort helps cardiovascular problems (similar to Hawthorn (Crataegus species), Lemon Balm (because of the flavonoids and polyphenolics found in this herb) has been identified as inhibiting the excessive thyroid stimulating hormone (TSH); Bugleweed has the ability to inhibit binding of the stimulation antibodies of Graves’ disease to the thyroid cells, blocking thyroid stimulating hormone (TSH) production and possibly inhibiting the iodine metabolism. Reference: Yarnell Eric, N.D. R.H, Kathy Abascal J.D, R.H. Alternative and Complementary Therapies, June-2006. Botanical Medicine for Thyroid Regulation. How to treat the underlying immune system disorder, so Graves’ disease can be reversed permanently? What therapies does the conventional medicine have to treat the auto-immune system disorders? Unfortunately, none! First, we have to determine what is an auto-immune system and what it does. Bluntly put, it protects your body from invaders: so called foreign organisms that are trying to destroy the body. If the immune system is under-active, cancer type disorders may manifest itself; if it is overactive- then asthma and allergies are presented, and if it confused and malfunctioning, then disorders like Graves’ disease, Hashimoto’s, Rheumatoid arthritis, Lupus etc. may develop. In the last case, the immune system simply does not have the ability to tell ‘self” from “non-self”. I also believe that there are a few main factors that set the grounds for Graves’ disease development on a first place. They can be divided to physical and psychological. The diet that I highly recommend for Graves’ disease and hyperthyroidism patients is low- iodine diet, rich of goitrogenic foods and cruciferous vegetables like Broccoli, cauliflower, cabbage, millet, spinach, Brussels sprouts, and radishes. The two major substances that work directly on the thyroid function and are present in these foods are isoflavones and isothiocyanates and they actually appear to reduce thyroid function naturally by blocking the thyroid peroxidase hormone. Reference: Gaitan E, Lindsay RH, Reichert RD, Ingbar SH, Cooksey RC, Legan J, Meydrech EF, Hill J, Kubota K.J Clin Endocrinol Metab. 1989 Apr; 68(4):707-14.Antithyroid and goitrogenic effects of millet: role of C-glycosylflavones. ; 2. Chandra AK1, Mukhopadhyay S, Lahari D, Tripathy S. Goitrogenic content of Indian cyanogenic plant foods & their in vitro anti-thyroidal activity. ;Indian J Med Res. 2004 May;119(5):180-5. Along with the foods that I recommend to consume there are others that you should definitely avoid: aspartame, all foods with high iodine content (sea food for example), MSG (monosodium glutamate), or so called Chinese Restaurant Syndrome, spicy foods, caffeine and hard alcohol, artificial sweeteners of any kind. These foods and substances affect the thyroid symptoms in a very negative way. 2. Leaky gut syndrome is a condition that may lead to Celiac disease. This syndrome will occur if the lining of the intestines become impaired or inflamed and this will allow toxins and gluten, as well as other substances that are not supposed to be there to enter the blood stream, thus, alarming the immune system that there are invaders in the blood. It is believed that going on gluten free diet to repair and heal the gut will lead to the recovery of the autoimmune system and this is true in many cases. Gluten free diet, in fact, helps auto-immune system conditions like Graves’ disease and Hashimoto’s, as reported by many patients. 3. Yersinia enterocolitica (bacteria). There is a significant scientific evidence that the bacteria Yersinia enterocolitica may be related to autoimmune disorders like Graves’ disease. In a few scientific types of research was found that people with thyroid disorders, and specifically Graves’ disease, have also Yersinia infection, which was connected with the production of anti-TSH receptor antibodies. Yersinia infection can be easily diagnosed and treated and should not be ruled out as a potential factor for Graves’ disease. This is very important to be checked when suspecting Graves’ disease in children, as they are mostly affected by this bacteria (eating contaminated food). Reference: 1. Shenkman L, Bottone EJ. Antibodies to Yersinia enterocolitica in thyroid disease. ;Ann Intern Med. 1976 Dec;85(6):735-9.; 2. Takuno H, Sakata S, Miura K. Antibodies to Yersinia enterocolitica serotype 3 in autoimmune thyroid diseases. Endocrinol Jpn. 1990 Aug; 37(4):489-500. 4. Helicobacter pylori infection. A study conducted in 1998 found a link between H. Pylori and autoimmune thyroid diseases like Graves’ disease and Hashimoto’s. The prevalence of H. pylori infection was markedly increased in the patients with autoimmune atrophic thyroiditis (85.7%), compared with the control groups. Reference: de Luis DA1, Varela C, de La Calle H, Cantón R, de Argila CM, San Roman AL, Boixeda D.J Clin Gastroenterol. Helicobacter pylori infection is markedly increased in patients with autoimmune atrophic thyroiditis. 1998 Jun;26(4):259-63. 1. Aloe Vera gel -it contains a very important substance, called acemannan, found in its sugar part. It is a long chain polysaccharide and acts as an immune modulator. I personally found Aloe vera gel extremely beneficial. 2. Colostrum or LDN (Low Dose Naltrexone). The main components in Colostrum (or Bovine colostrum) are immunoglobulin and lactoferrin, found to fight viruses and bacteria in newborns and able to restore the human immune system. Colostrum is also believed to be able to close holes in the gut and alter immunity, and the proline-rich polypeptides (PRPs) found in it are powerful immune modulators. LDN, on the other side, is an opiate antagonist, which works by blocking the opiate receptor on immune and nervous system cells. It is a well-known drug for treating alcoholism but has been used recently to treat many autoimmune disorders. Its action consists of increasing the endorphins, which are responsible for the “feeling of happiness” and are natural pain reducers. The research on the efficacy of this drug for autoimmune disorders is still controversial. I still believe that you can achieve happiness by other means, not just taking drugs. 3. Probiotics. They affect positively the gastrointestinal tract, helping the leaky gut syndrome to heal. They are also found to be helpful for treating Yersinia and H. pylori infections as well. 4. Isopathics: initially developed by the German scientist Professor Dr. Günther Enderlein these substances are not so well known in the USA, but in Europe they’ve been used for decades as a powerful regulator of the immune system and detoxification stimulators. They re-educate the confused immune system, decrease excessive inflammation and also provoke the immune system to fight pathogens. Usually given in low doses, very much like homeophatic medicine, isopathics act as balancers and adaptogens: they either increase or decrease the immune system response, depending on what the body needs. 5. There are many other alternative therapies that can help Graves’ disease and hyperthyroidism and which I simply don’t have the space to list: aromatherapy, chromotherapy, acupuncture, dance therapy, energy medicine like Reiki, reflexology, meditation, Tai Chi and Qi Gong. But I have included them in my books and articles. Everyone one of them contributed to my healing process, and they still do. Graves’ disease is a body- mind disorder, meaning that your mind (conscious and subconscious) plays a big role in the onset of your thyroid disorder. I am not stating this fact just because I have a Masters degree in Psychology and I’ve been coaching and helping people for over 15 years. Through the years I’ve also collected and enormous scientific research that proves that Graves’ disease, in fact, has a psychological and emotional background! My newest book “Mental, Emotional and Psychological Aspects of Thyroid disorders” covers my extensive research in that field. Graves’ disease and other thyroid disorders surely have emotional, psychological and mental aspects, meaning that not only some of the symptoms are purely psychological, but also that psychological factors played an important role in the onset of the thyroid disorder in a first place! 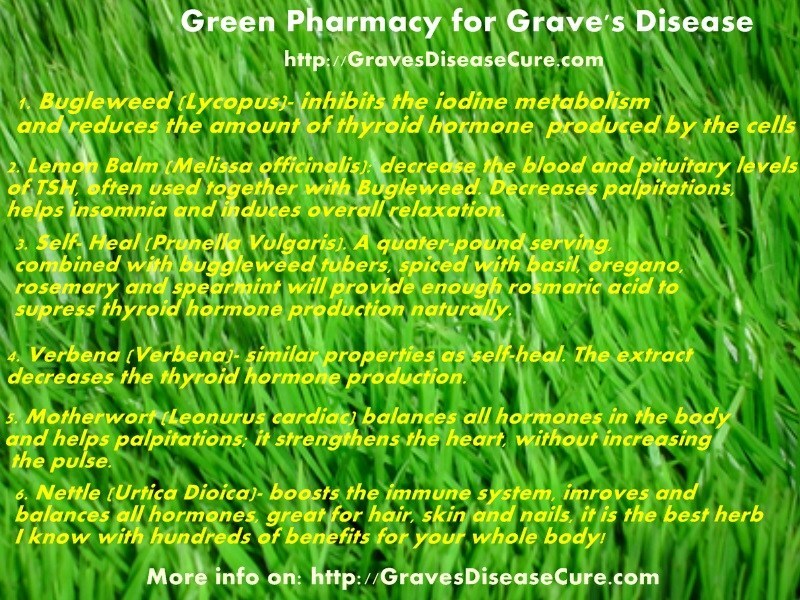 I am today convinced that Graves’ disease is not only about what you eat, drink or hormone imbalance. It may represent itself also with anxiety, depression and emotional lability. The emotional state or response to stress can also modify a person’s capacity to cope with infection and influence the course of autoimmune disease. 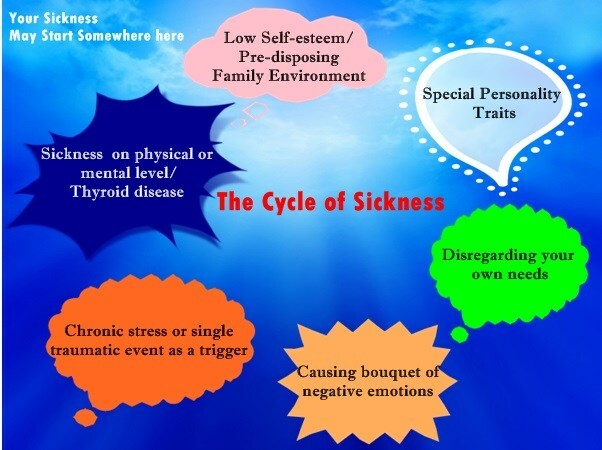 Unhappiness, low self-esteem, lack of self-love, basic needs not met, specific personality traits and inability to handle stress are some of the major factors contributing to the development of Graves’ disease and hyperthyroidism. I believe today that the beginning of the healing process of an autoimmune disorder like Graves’ disease starts with taking care of emotional and psychological state first. As Stanley Keleman once said: “Our body speaks our mind”. You are what you think and this should be your starting healing point. To find details, specific recipes and natural treating plans refer to my books and go by your primary interest. I’ve covered in details all the topics presented on this page, one by one. The books contain numerous powerful concepts, techniques, recipes that will open up countless new ways to dramatically change health, life and deal with the sources of Graves’ disease and hyperthyroidism. They will change the entire way of how Graves’ disease should be treated! Disclaimer: Have in mind that this information is intended for educational purposes only. It is not intended, nor should be interpreted as medical advice or directions of any kind. You are strongly advised to consult your own medical doctor/ endocrinologist for all matters involving your health and medical care.